Saxo (2000) 16:32 16,00 kr. Corrosions (2001) 8:48 9,60 kr. Dif:rq! (2001) 14:21 12,80 kr. Irazz (2001) 10:16 12,80 kr. Le Psaume Salé (2001) 12:19 12,80 kr. 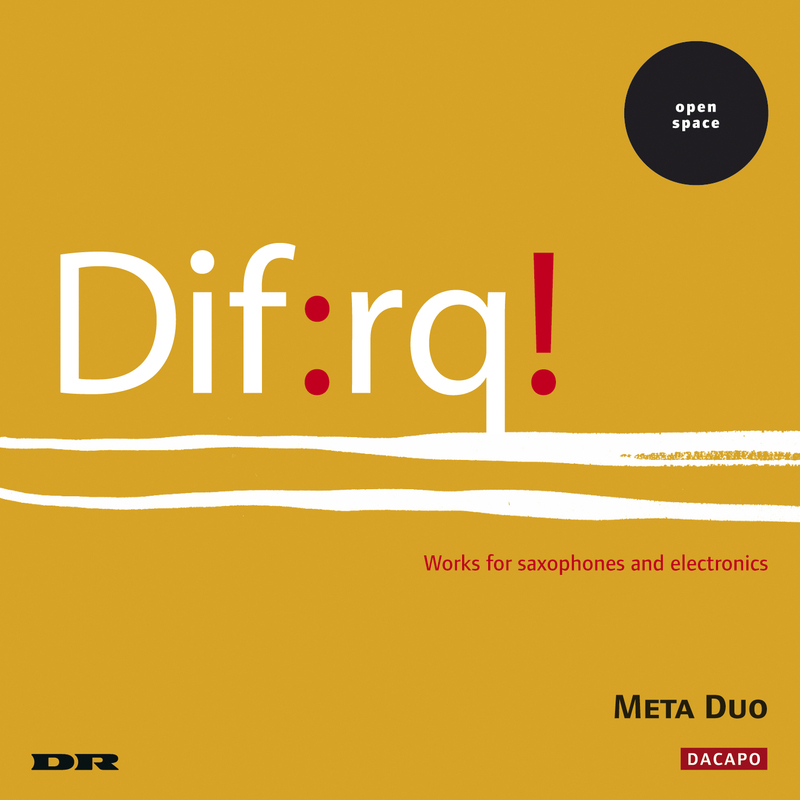 The works on this CD were composed for Meta Duo, and the earliest of them is written by Ivar Frounberg. Because of the similarity between the name Saxo and the word saxophone, and because of Ivar Frounberg's fascination with Saxo's writings, the title Saxo suggested itself. However, the music has no direct references to stories in the work of the Danish chronicler Saxo, who in the years about 1200 wrote an early Danish history in Latin. The work does however itself involve a number of stories which come to expression through harmonic structures, tempo relations and melodic lines. The piece is divided into five sections, each of which introduces a new saxophone instrument: first the sopranino, then the baritone and the baritone again, then the alto and finally a duo for alto and contrabass saxophone. There are two slow movements between more active movements, but the tempo changes between the movements do not follow the changes between saxophones and harmonies and therefore contribute to a certain ambivalence in the experience of the form. The electro-acoustic elements add further dimensions and layers. Jens Hørsving's music is in the borderland between the classical and the popular-rhythmic tradition. The classical structures, methods and techniques encounter the amplified, energetic universe of ‘rhythmic' music, whose direct musical nerve is preserved without sidelining classical music's attention to detail. In Corrosions for soprano sax and electronics the instrumental lines and electronic soundscapes are subjected to various attacks of musical corrosion. The attacks range from light assaults that only make scratches on the surface to severe corrosion where the whole construction collapses. Hans Peter Stubbe Teglbjærg's Dif:rq! - Paraphony for saxophones and electronics takes its point of departure in the historical Greek -aulos, a double-reed twin-pipe wind instrument that was very common in ancient Greece. The family relationship of the saxophone with this historic shawm prompted Hans Peter Stubbe Teglbjærg to set out to rediscover what one could call the lost polyphony of the wind instruments. The cryptic title Dif:rq! can be read as an abbreviated form of di-frequency, that is two pitches, or of differential frequency, which is the difference between two pitches. Both meanings and their nuances are involved in the use of diphony in the piece. There is a further duality in the Greek-derived word ‘para-phony', which can be translated as co-sounding, that is a sound or note that sounds together with another. In Morten Olsen's Irazz the listener is not only invited down into the depths, to the sounds that the composer knows so well from his place behind his double bass; but also down into the dark interior of the Costa Rican volcano Irazz, where daylight never penetrates. Although eruptions of the volcano are few and far between, the volcano is in constant activity. Inside it thick-flowing melted stone, gases and masses of energy must wait for centuries for a releasing eruption. In Irazz there is no real eruption, but despite inactive periods one constantly senses the energy that could lead to an explosive eruption. These deep, disturbing sounds are played on a bass saxophone assisted by the electronic elements, where recordings of low saxophones and double basses are treated and distorted, often beyond recognition. With the aid of principles from ‘spectral music' the Faroese composer Sunleif Rasmussen carries on the musical tradition of the Faroe Islands in his works. In the finished work, though, one rarely hears direct quotations from folk music. Instead Sunleif Rasmussen uses the traditional Faroese melodies structurally, among other ways by determining time values on the basis of the intervallic proportions of the melody, and from the individual notes of the melody he generates sound via the harmonic spectrum. This is also true of the work Le psaume salé (The Salty Hymn). The musical material is a reworking of Thomas Kingo's hymn Lov og tak og evig ære (Praise and thanks, eternal glory) as well as two Faroese variants of the same hymn tune. Towards the end one can hear, in an electronic reworking, the melodic variant from the Faroese district Tjørnuvik as sung by two elderly men.